1080p VS. 4320p resolution: Is 8K Really Better? 1080p vs. 4320p Video: Is 8K Really A Better Choice? Confused about 1080p & 4320p resolution videos? This article details on everything you need to know about 1080p full HD videos and 4320p, aka 8K Quad UHD videos. If you're hesitating to purchase a better expensive monitor. Read on, and you'll find these thoughts rather insane. Want to play videos of any resolution from 1080p to 4320p? A professional harware accelerated media player -5KPlayer is what you are worth having. You can rely on it as a 8K video player as well as a 8K video downloader to make the visual journey a more pleasant one. Now download and give this freeware a shot! From the aspect of data, 1080p means 1920 x 1080p = 2073600 pixels; 4320p means: 7680 x 4320p = 33177600 pixels, that's a damn 15 time increase! But, have you ever thought about real experience –bigger file sizes for higher levels of detail means you being able to all the better make out the pores and poxes on one's face while they're on TV, and that would be awful. As human eyes can tell only so much detail, 4320p video is way beyond our visual ability. And how many of us are willing to face a 4320 monitor as large as a TV set on their desk? Though, more resolution means more potential in all sorts of areas, that's for speculators. Unlike 1080p video, 4320p videos are really limited to a few test video clips, while 1080p videos and movies are everywhere, online or contained in Blu-ray discs. At least for now, the best internet speed and bandwidth cannot yet meet the 4320p video requirement for a smooth view. For both Mac and Windows computers, 4320p videos require much more than the average level of computer specs, which can easily deal with 1080p videos. Windows: Intel Core 4th Generation i7-4790, 12GB DDR3, 1TB HDD, NVIDIA GeForce GT 720 1GB DDR3. Therefore, before miring yourself in massive expenses, think about whether you've got that much money to burn. And FYI, if you want a 4320p monitor for gaming, forget it. That can be even demanding! A lot more media players like WMP, can play 1080p videos but fall short in 4320p video playback support. In case that you seriously mean to find a media player that can handle 1080p & 4320p videos, we would suggest you 5KPlayer. The combination of functions –download, play and AirPlay makes 5KPlayer nothing short of a rarity with a lovely UI. And above all, it's totally free! From the comparisons you can see that we're not here intended to make you feel better, but 8K res really gets a long way ahead as it's still in its infancy. 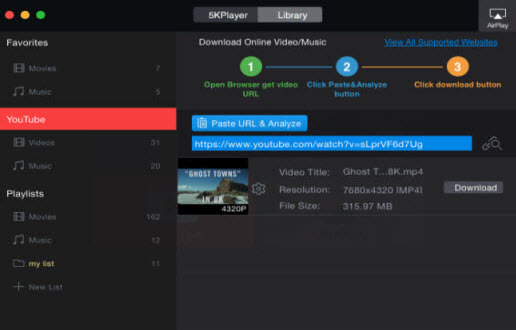 Every new technique rolling out does not necessarily mean that we all should grab a piece of it, but we can begin preparing something cost-free like 5KPlayer that connects now and the future seamlessly, which for sure enables you to free download and play both 1080p&4320p videos from over 300 online websites and can AirPlay the 1080p & 4320p movie videos from your Mac/Windows to HDTV. How to Download and Play 1080p & 4320p Videos with 5KPlayer? 5KPlayer will remind you of a successful download by showing the number of saved 1080p/4320p videos in the playlist. Step 6: Double click the target 1080p & 4320p res videos to start playing. Though 4320p is too much for us, getting somewhat prepared at a reasonable cost for the future to come would not go wrong. 5KPlayer is a second to none choice for you to free watch & download HD (1080p)/FUHD (4320p) videos. And if you've got an 8K TV at home, you can even AirPlay the 1080p & 4320p videos to big TV with 8K display. Transfer 8K Pics between PC & iPhone. Batch-delete unwanted iPhone 8K photos. Best free 8K player for Win 10 bypasses the abandoned WMC and jumped to be the best 3rd-party player to play 8K video on Win 10. Playing 8K Movies on iMac/PC is like doing math for most of us now. 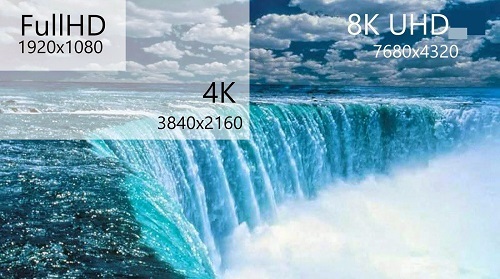 If you want to play movies in 8K on computer or 8K TV, there are factors need to be considered. 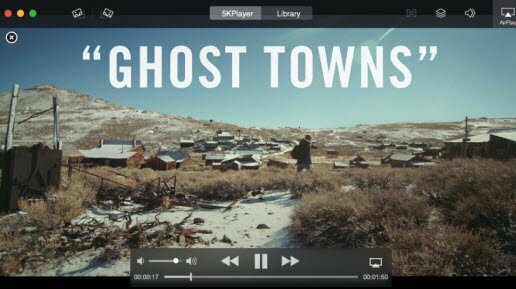 Top free 8K video players for both Mac and PC (Windows 10) are recommended here to play 4K/5K/8K ultra HD movies smoothly.